I think we are all in agreement that my papaya cardi is a fail. For me. I still like the sweater but not on my body. I should have known that I don’t look good in a swing-type style. Loose and swingy is not me. Tight and ultra fitted isn’t me either. Shaped with a little ease, now that’s me. Looking back I think that’s the reason I was having such a hard time finishing it. Deep down inside I knew it wasn’t right for me. I knew from the schematic that it wasn’t the right shape but I started it anyway hoping it was more fitted as I knit. I am looking for a pattern that has more shaping through the waist, not too long and not too short, shawl collar (V-neck), 1-3 buttons to define the waist and can be made with the amount of yarn I have. Knit Picks Wool of the Andes, worsted weight, 10 balls, 110 yds/ball. In the meantime, do you hear frogs? Rip-it, rip-it, ribbit? 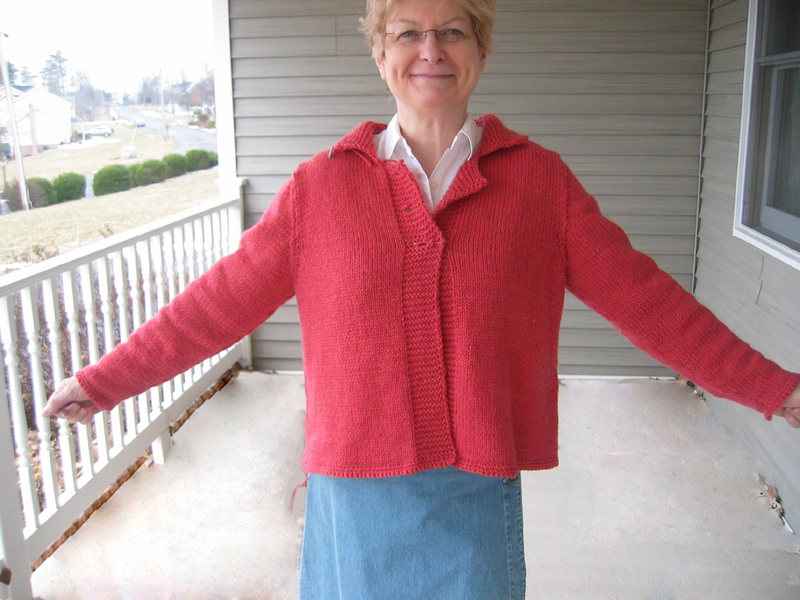 This entry was posted in finished object, knitting, pattern, sweater and tagged finished object, knitting, pattern, sweater, yarn by Patti_is_knittinginflashes. Bookmark the permalink. This is beautiful. I can’t bear the thought of you ripping up all that work. I love the flair at the bottom. You should accentuate the flair with more yarn, like a pleat or a lovely wavy ruffled trim. I see sweaters like this with those extras that sells for hundreds of dollars. Look on Etsy, and you’ll see what I’m talking about. This is a beautiful sweater, and I personally think you look lovely in it. Perhaps you should gain some weight. That’s a joke Patti. But seriously, I love the Anne Hall look, and this color is great for you. Very cute picture. Very cute sweater. Too bad that the sweater is a fail. You just can’t tell how you will look in hand-made sweater. Hope you find something to use the yarn.